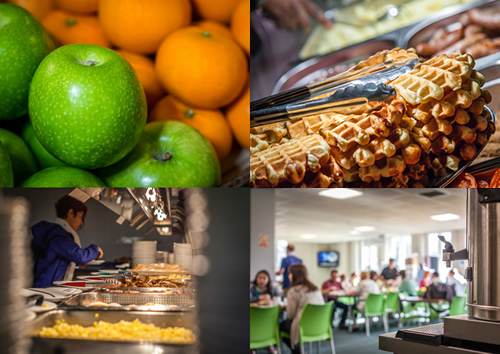 We provide catering facilities at Rosebery Hall, Carr-Saunders Hall, Passfield Hall and Bankside House. For people staying at these halls, dependent on your room type you may receive a complementary cooked breakfast. We also provide meals for groups and would ask you to contact us for a specific meal plan quotation so that we can do our best to meet your requirements. We can include breakfast, lunch, dinner or all 3 meals. Lunch from £10.00 per person including VAT. Dinner from £12.50 per person including VAT. Packed Lunches available from: £8.40 per person including VAT. For alternate LSE catering locations you can head to the central campus located by Aldwych and a 5 minute walk from Holborn tube station. Please note that these LSE catering locations are not included for your complementary breakfast. sandwiches. Head downstairs to the basement for a home cooked, freshly prepared meal by our in house chef. Meals start from just £3.60. smoothies fresh salads and a variety of hot snacks are also available! range of sandwiches and snacks combined with a lovely outside seating area makes The Plaza Café a great place hang out. The LSE’s very own traditional 19th Century pub with distinctive Victorian architecture. Serving a selection of ‘real’ ales, cold beers, wines, spirits and bar snacks, the George IV is perfect for a pub lunch. Alternatively head over in the evening for a nice casual drink and relax amongst friends.